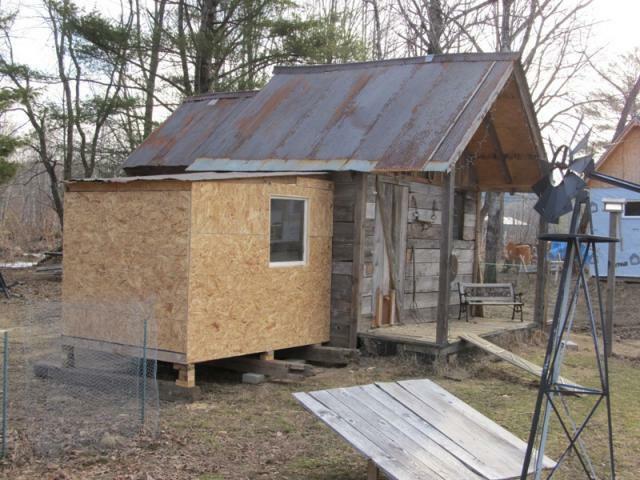 Here is a few pictures of our coop.The coop is 8' x 12' with a 4' x 6' addition giving us 120 sq.ft. The roof has a 12/12 pitch which allows for a loft where we store hay, shavings, feed, etc. The chickens sometimes go up in the loft to lay eggs. 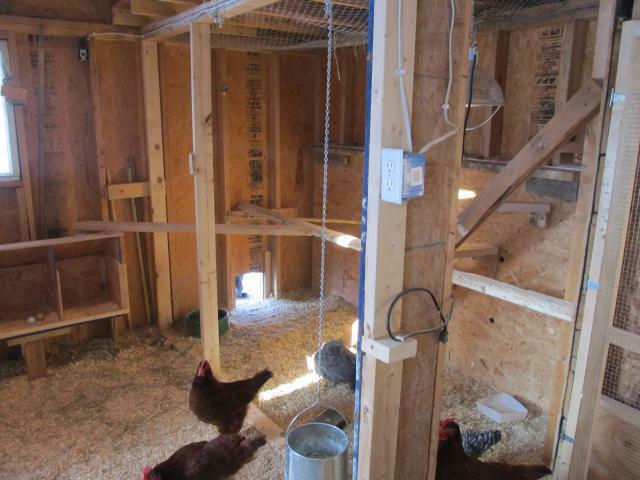 There is electricty in the coop for lights, water in winter, and there is also a wireless camera to check on the girls whenever we feel the urge. We made this the fall of 2009. It was made from some material from a 150 year old barn we took down the year before. The floor is part of the old barn floor, but covered with plywood to be tight and no critter intrance. 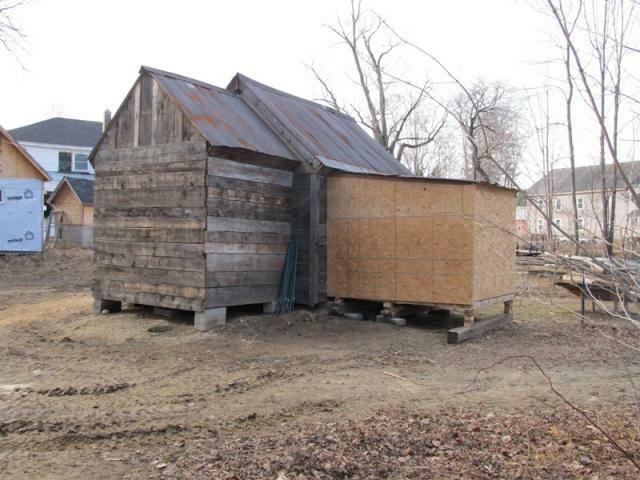 The walls are constructed with 2x4's and OSB sheathing, then covered with siding that came from boards off the barn roof. 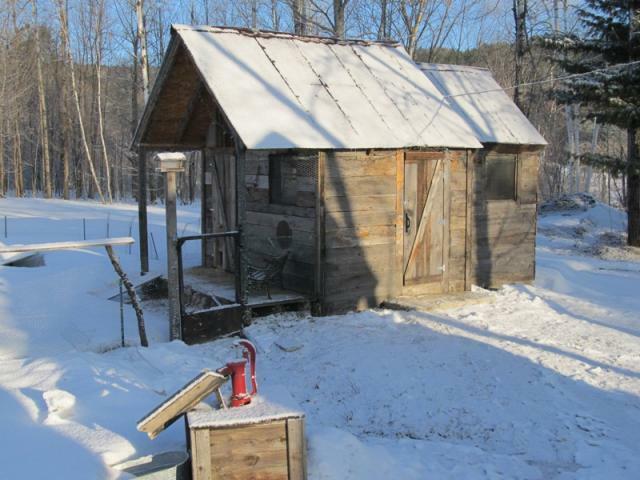 The metal roof comes from the barn roof which had replaced the old wooden shingled roof back in the 40's. The roof rafters also came from the barn roof. The chicken entrance is on the porch on the bottom of the fake door. We modeled this after Granny's shack on the Beverly Hillbilly's. The chickens did well this winter in the coop. Never had a rodent or signs of one in the coop, or feed. Of course, if there was one, I'm sure the chickens would of taken care of it. 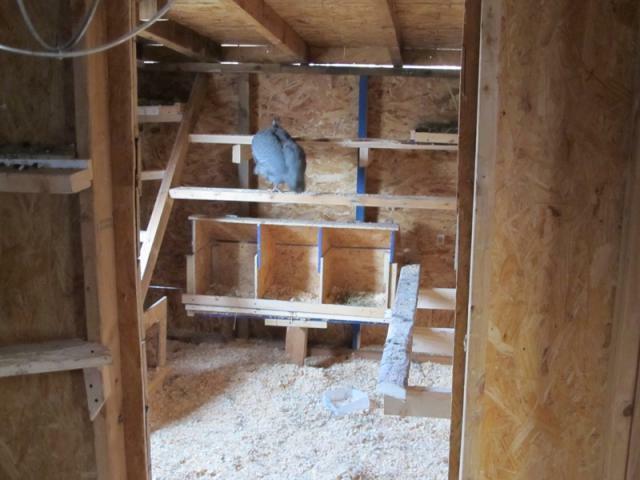 New roosts & nesting boxes inside new addition. Winter of 2011 waiting for Spring. 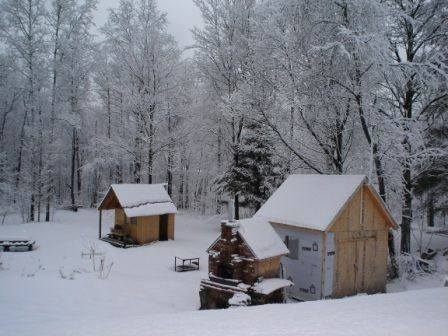 Winter of 2010 before siding. Chickens came the spring of 2010. 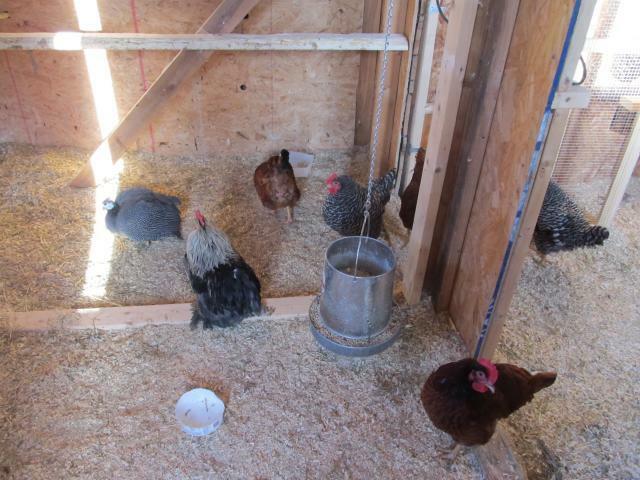 Interior picture showing some of the chickens, one rooster, and one guinea. A guinea and a chicken roosting in the brooder area for new chicks. This can be closed off from the elders until it's time to join the clan. Another picture of inside looking other way from brooder. 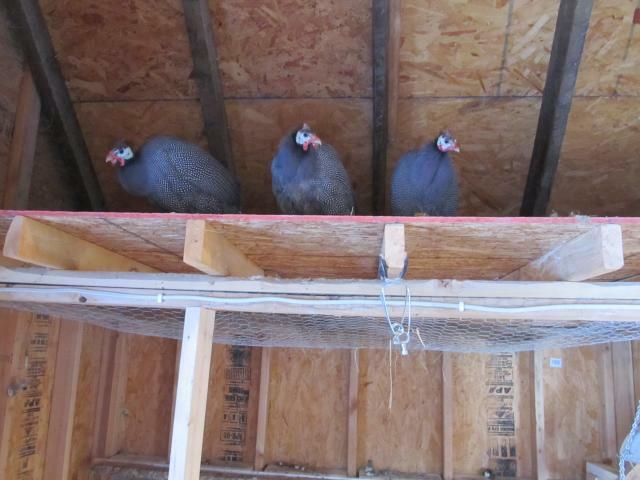 Three Guineas roosting up in the loft before I throw some hay bales up. Nice looking coop but not a lot of detail on how you did what you did. "Nice pics - not a lot of "how to" details"
"Great use of space and materials"
This is a really nice and quaint little coop. Some of the best features are the use of materials and indoor space. 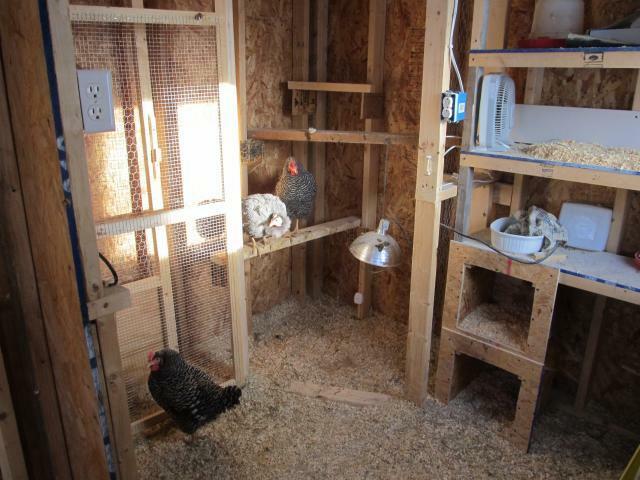 Your ladder-system roosts are a great idea and your nest box layout is wonderful as well. I would definitely recommend this coop to anyone looking for an efficient design. Yes the Guineas were raised with the chickens. They share the coop with no dividers. Though the Guineas are the kings and queens of the coop there is no fighting. When free ranging, the guineas go their own way. Were your guineas raised with the chickens? Thanks Rookie, all the birds hang together with the exception of my Silkies. The Silkie rooster is a fighter so they have their own area in the coop. The Guineas are great, nothing get's past them. They will walk any stray dogs off the property. Haven't lost a chicken yet. Really nice! And I love that your guineas are hanging out with your chickens. Your property is beautiful.